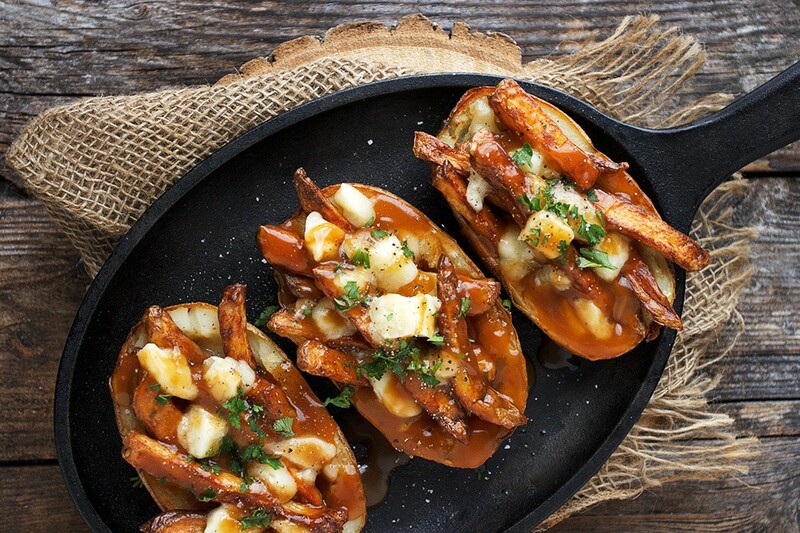 Poutine meets potato skins in these delicious Poutine Potato Skins. No plates required. Great football food! 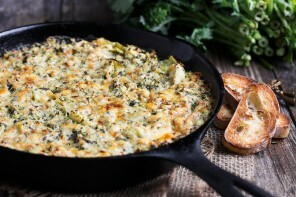 Be sure to check out the “Cook’s Notes” below for a few more tips and ideas for this recipe. If you can’t find cheese curds, the next best alternative would be pizza mozzarella cheese, torn (not cut! ), into large chunks. Here in Canada, poutine sauce/gravy is widely available in both dry mix and cans. You could also use a beef, brown or chicken gravy. Or try combining beef gravy with chicken gravy, for something that approximates a poutine gravy. 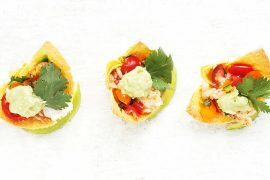 Delicious and perfect for game day eats! Make your own fries or use frozen fries and bake them with the skins. Preheat oven to 400° Scrub potatoes, pierce with a fork a couple of times and place on a baking sheet. Bake in preheated oven 60-75 minutes until soft (test by inserting a sharp knife along the side edge - where you will eventually cut it in half). Remove potatoes from oven, leaving oven on. (If baking frozen fries, set oven temperature to that needed for the fries). Allow potatoes to cool 15 minutes. Cut potatoes in half lengthwise. Scoop out potato, leaving a 1/4-1/2-inch of potato on the skin. Place hollowed out skins on baking sheet, skin side down. Brush with melted butter or oil and sprinkle with salt and pepper. (Note: If baking frozen fries, save time by placing them on a baking sheet together with the potato skins. If you're not cooking your fries in the oven, you could also broil the skins to crispy them up. It's quicker, but do watch them closely so they don't burn). 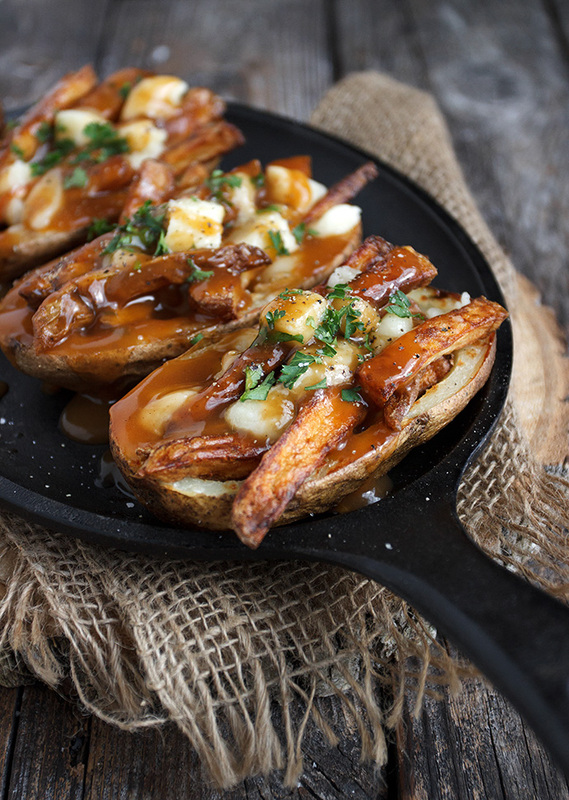 To serve: Top potato skins with cooked fries. Sprinkle with cheese curds and ladle gravy over top. Garnish with chopped parsley, if desired. Love these skins, what a perfect game day treat! Oh my gosh, you’re right Jennifer, these would be perfect for watching the big game. Or for just chatting (and eating) with friends while everyone else is watching the big game (that would be me). What a fun, unique and delicious combination! Thanks Chris :) The food is a big part of the day! I’m more into the food than the football too, although I do LOVE football… I just love food so much more! 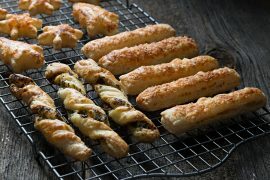 ;) These skins look seriously delicious, Jennifer! Total drool-fest happening over here! 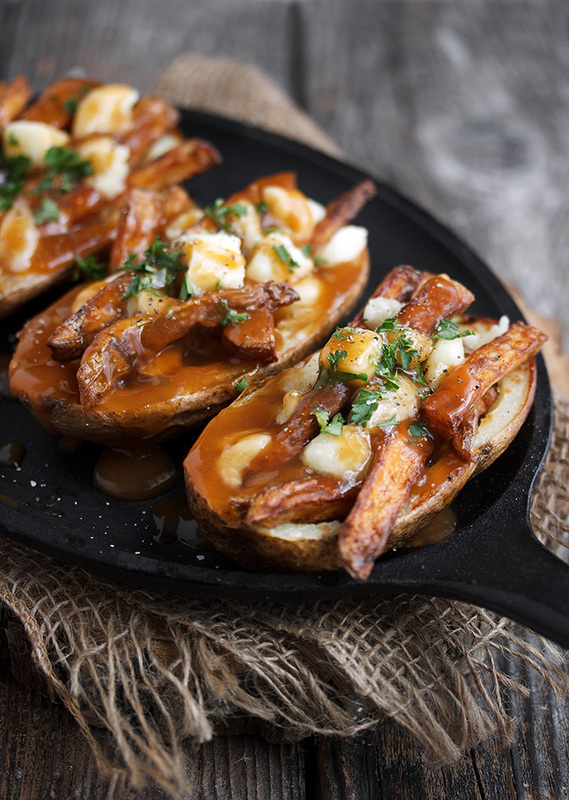 Poutine is amazing on its own, but stuffed into some potato skins?! HEAVEN! I want to reach through my screen and eat ALL this stuffed scrumptiousness! GIMME GIMME! Pinned! Cheers, friend! This is new for me! Where has poutine been all my life? Sounds and looks wonderful and with fries and potatoes and cheese – PERFECT football / game day deliciousness! (I accidentally typed foodball instead of football – haha) Totally perfect man food – Have a lovely day! Thanks Tricia. 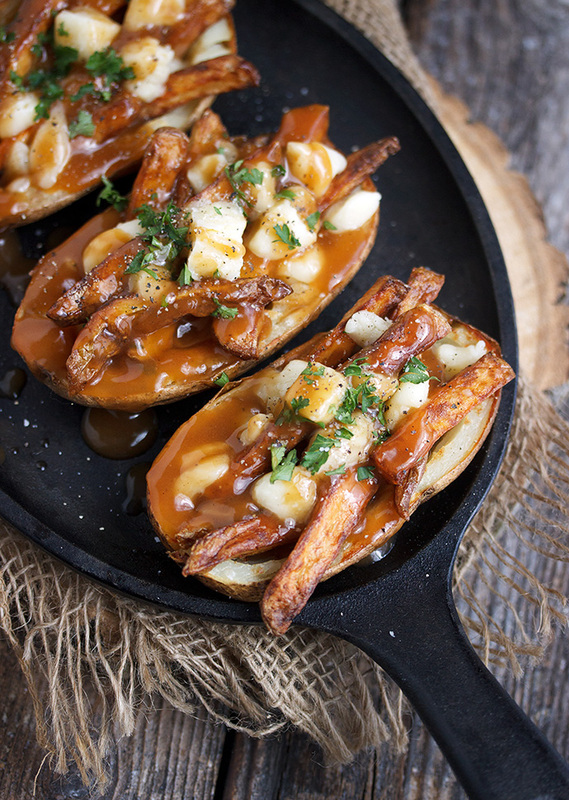 Poutine is a Canadian staple – on every menu of just about every restaurant :) It is the ultimate comfort food. Definitely worth trying! Potatoes inside potatoes? YES!! Major yum. Wow Jennifer! You have outdone yourself! This looks totally fabulous! 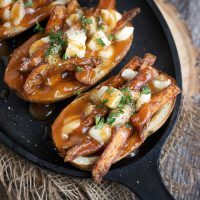 I’m embarrassed to say I’ve never tried poutine, but after looking at your recipe and your amazing photos I NEED to try it soon! Wow you are like the master of comfort food! This looks amazing! This is the kind of food that when you eat it you instantly feel good! You are the absolute best flipping human for coming up with this! Pure genius! !